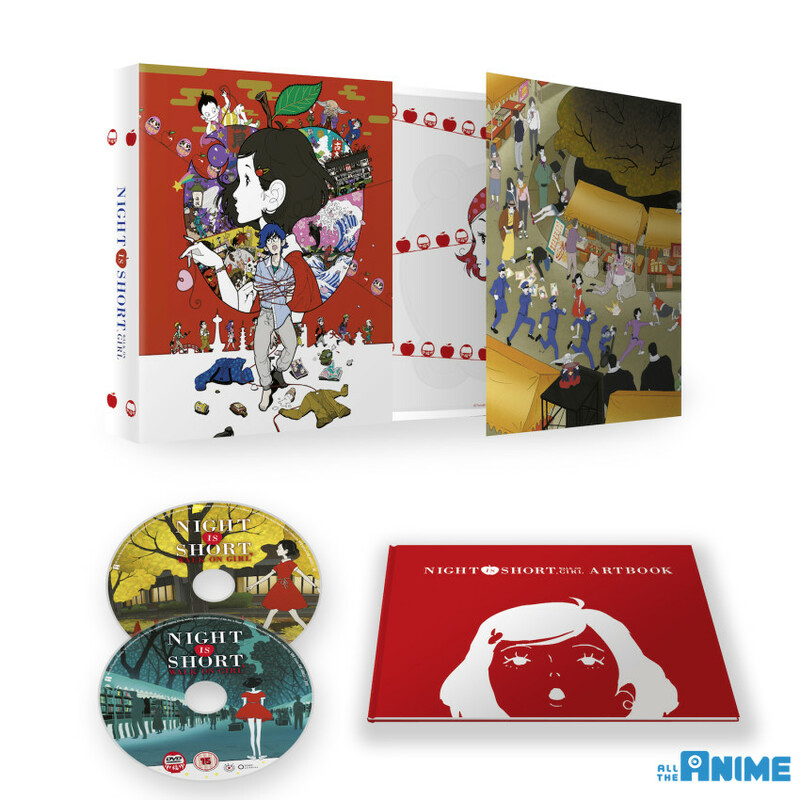 “Night is Short, Walk on Girl” Home Video Release Details. Coming to Blu-ray and DVD from 25th June 2018. In 2017 we had the pleasure of bringing two of Masaaki Yuasa’s recent films to the big screen, the first was Night is Short, Walk on Girl, and in the winter it was Lu Over the Wall. Both will be receiving home video releases soon. We’ll have more details for what to expect with the latter of the two in the coming weeks, but today we’re going to give you a rundown on what to look forward to with our upcoming release of Night is Short, Walk on Girl. If you’re not familiar with the film, have no fear as we’ve got a quick primer for you to bring you up to speed. 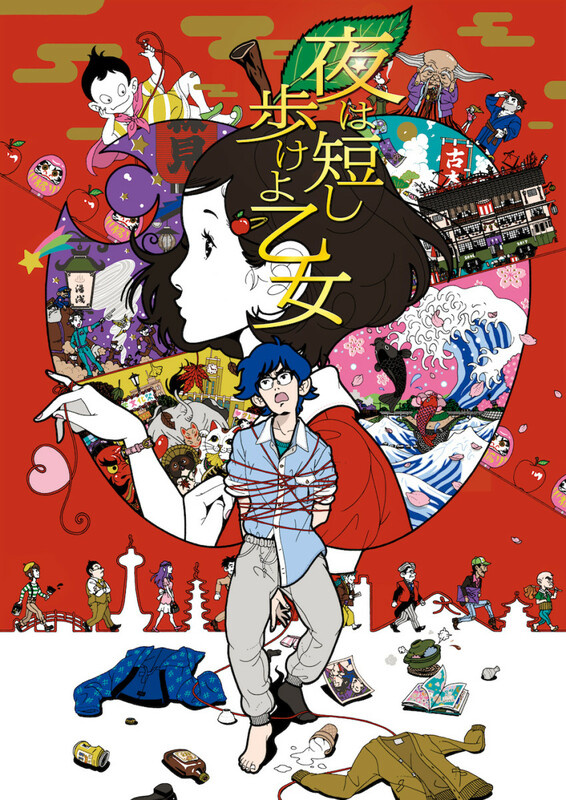 Let director Masaaki Yuasa (The Tatami Galaxy, Lu Over the Wall, MIND GAME) walk you through an eccentric, colourful journey of love, life and youthful exuberance unlike anything you’ve seen before. WHAT’S PLANNED FOR THE RELEASE? We will be releasing the film on both Blu-ray and DVD. There will be a Ltd Collector’s Ed. Blu-ray+DVD set, as well as standard Blu-ray and DVD versions available from 25th June 2018. The Ltd Collector’s Ed. Blu-ray+DVD set will come packed in a rigid case with a digipack to hold the Blu-ray and DVD discs. Also included is a 52-page art book that is divided into three sections; Characters, Settings and then in a change of pace we’re including an essay written by Andrew Osmond (author of 100 Animated Feature Films). It works as a great companion to the film and is a great read whether you’re familiar with the film, or perhaps other titles of Masaaki Yuasa’s, or not. If that wasn’t enough, on the disc themselves you’ll also get an interview with director Masaaki Yuasa and there’s also some Japanese previews of the film too. In case you’re not aware, the film is in Japanese with English subtitles only. (No English language dub has been produced for this.) The audio option for watching the main feature is Japanese 5.1. But we also want to make it known to you that there will be an offer exclusive bundle to AllTheAnime.com! 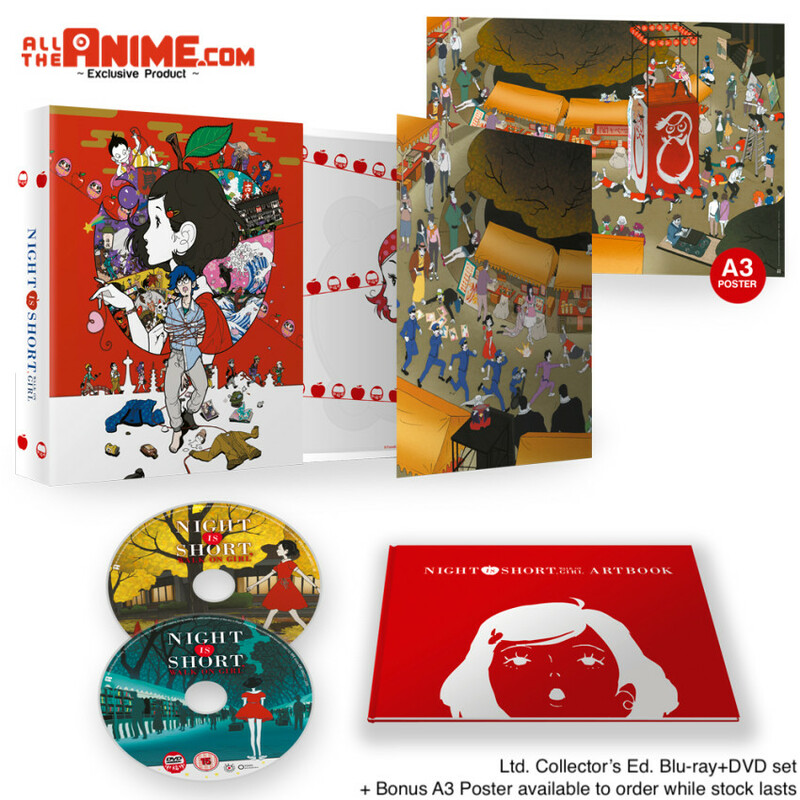 We’re happy to announce that we will be offering an AllTheAnime.com exclusive bundle of the Ltd Collector’s Ed. Blu-ray+DVD set that will also come with a bonus A3 poster! You can see a visual of this below. The poster itself depicts the same image that graces the outer side of the digipack; which is an outdoor scene involving many characters you see in the film. It’s a great image and we knew there would be some out there who would love to be able to have that as a larger image, us included! We will begin taking orders for this AllTheAnime.com exclusive bundle from 15th June 2018 there will be a specific cutoff period that will be made known when pre-orders begin. Once that cutoff has been reached, there will only be a small additional allocation of units that will include the poster. *NOTE 1: The bonus A3 poster will be shipped separately to the product itself and will potentially ship at a different time, be it before or after date of release, too. *NOTE 2: This offer is exclusive to pre-orders at AllTheAnime.com web shop only offer – this offer cannot and will not be valid for any purchases of this title where we exhibit at an event, or from any other online retailers. And that wraps up this preview of our upcoming release of the film Night is Short, Walk on Girl. We hope you’re looking forward to adding this film to your collection.